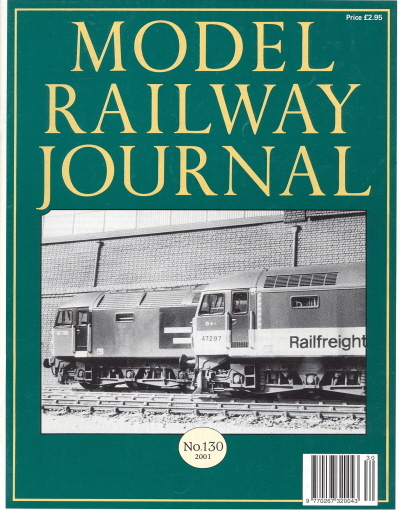 In 1984, following a discussion in the White Horse at Henley on Thames on the way back from Scaleforum and in the light of the success being enjoyed by the then new British Railway Journal, Paul Karau and Gerry Beale decided that Wild Swan Publishing should launch a new railway modelling magazine. Within a few hours and one phone call to Bob Barlow later, the foundations of what became Model Railway Journal had been firmly set down. Aimed at the "serious" modeller, but promising not to take itself too seriously, the magazine set out to provide a forum for those modellers who wished to progress beyond what was on offer from the ready to run manufacturers, whilst also providing a good read for interested observers. The instigators drew upon the experiences and models of a small group of "up and coming" modellers of the time, Monty Wells, Barry Norman and Iain Rice to name but three, in addition to revisiting the work of some of the hobby's "past masters". 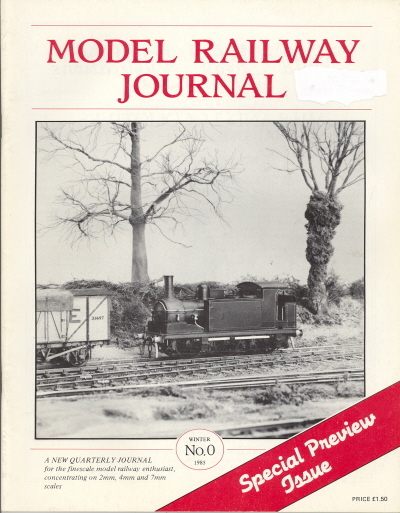 It was decided to produce a preview issue in order to show modellers what Model Railway Journal would look like and to test market reaction. Owing to some technicality within the magazine distribution system this very first issue would be idiosyncratically numbered zero. The now famous preview issue was accordingly published in January of 1985 and April of the same year saw the launch of issue one and the commitment to regular publication, initially set at quarterly intervals. 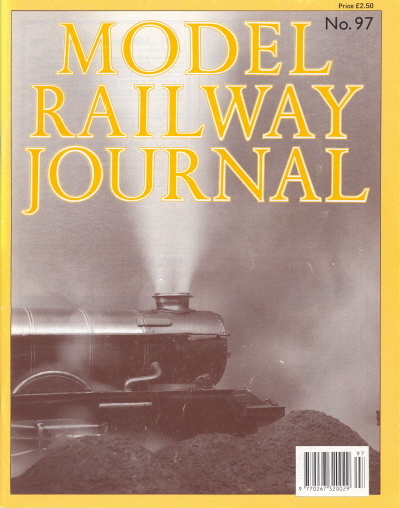 The editorship of Model Railway Journal was at first a double act, with Bob Barlow and Gerry Beale manning the helm. The preview issue, pictured at right, contained an enticing mix of subjects. A relative newcomer to modelling, John Watson, described his very appealing P4 model of Laxfield on the Mid Suffolk Light Railway, whilst the irrepressible Iain Rice described the construction of a "be-rivetted drudge" for his fictional "East Suffolk Light Railway". Monty Wells built a challenging kit for a Class 40 and foretold of a day when diesel modelling would be the fastest growing area of finescale modelling, whilst Geoff Williams allowed the new publication a fully illustrated feature on his magnificent recreation of Aylesbury LNWR. The first version of this seminal model railway had appeared in "Model Railway News" many years before. Other features included prototype reference material, a detailed article covering Ross on Wye's ex Broad Gauge goods shed and the intricacies of modelling Brunel's baulk road. The issue was rounded off with an exposition on working auto couplers based upon the "Sprat and Winkle" etched product and a feature entitled "Portfolio" which for this preview issue highlighted the breathtaking architectural modelling of George Iliffe Stokes. 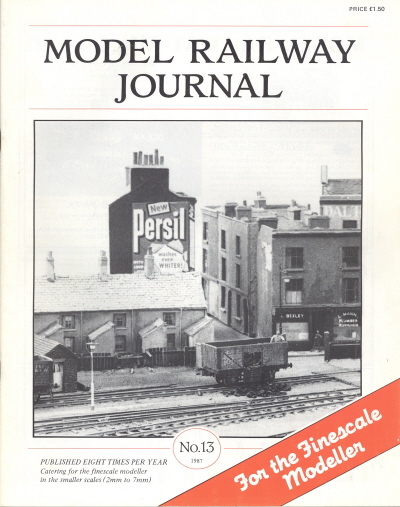 Model Railway Journal's "Portfolio" feature mirrored that of "Salon", a regular feature in the late "Model Railways" magazine, successor to "Model Railway News" and edited by Roy Dock before Cyril Freezer's takeover and its subsequent decline. 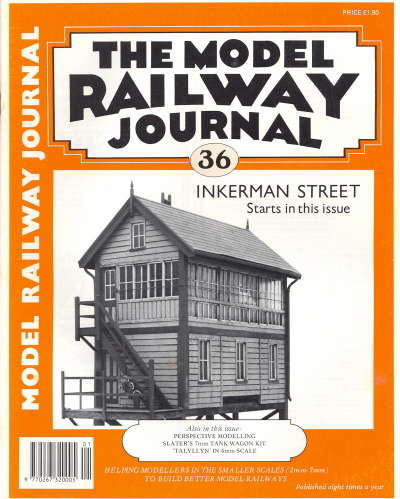 Although "Model Railways" in its heyday probably considered itself to be a general railway modelling magazine, it was arguably the closest in approach to Model Railway Journal of all the railway modelling magazines that had gone before, containing innovative and detailed articles on a wide range of railway modelling subjects and detailed examinations of an equally broad range of prototype reference material. The "Bazzing Around" feature in Model Railways largely covered SR subjects and was introduced by the late Roy Dock when he was brought in to revitalise MR in the early 1970's. I think it's probably true to say that the eventual demise of MR and the lack of a satisfactory replacement magazine eventually brought about the birth of MRJ. 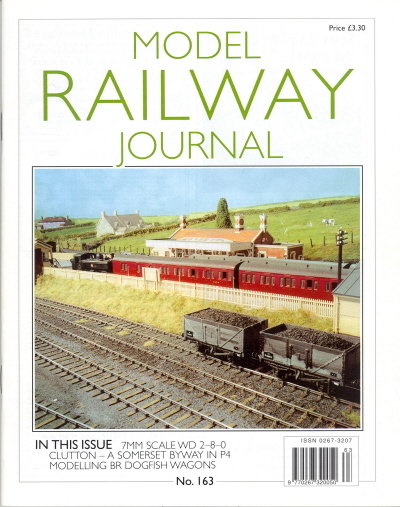 In the event Model Railway Journal (by now often referred to just by its intials MRJ) proved a huge success, its second year's volume ran to six issues and by the spring of 1987 when issue 13 arrived it was planned that eight issues would be produced each year. Still under joint editorship and with the same typographical style, issue 13 is one of my favourites from the early years. It contains an affectionate biography of George Iliffe Stokes, whose amazing work had caught my own eye and imagination in "Model Railway Constructor" back in 1971. Written by Malcolm Mitchell, who had been a friend of George and Doris's for 25 odd years, it drew upon the author's large collection of Stokes graphics and photographs and ran to 17 sides of the magazine. It makes great reading even now, moving and inspiring by turns and an account of a friendship as much as artistic and modelling achievement. In contrast this issue also contained the second part of Chris Crofts highly informative article on scratchbuilding model wagons. Running to 8 sides of the magazine and using works drawings from the orginal manufacturers and specifications, this and its companion articles are even today some of the best reference material available on the subject. Meanwhile, Iain Rice was getting himself tangled up in intricate elastictrickery, the founders of "Protofour" were correcting misapprehensions through the letters pages, and Gerry Hall had landed in "Portfolio" with his breathtaking structural modelling. This was the first sign of another great talent, later to appear as one half of the "Gerry and John Show" at the famous MRJ exhibition. 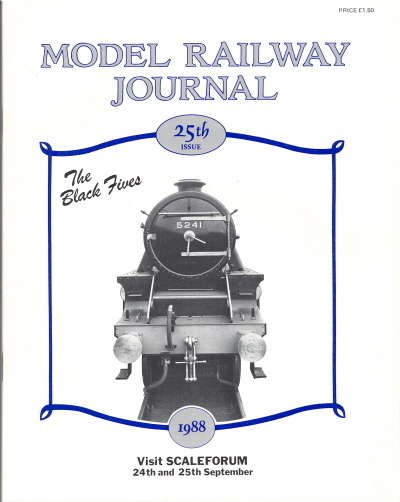 Issue number 25 had a specially designed cover to mark a "quarter century" of MRJs. Now in its fourth year, the editors reported that sales of copies were by now eight times larger than the sales expectation upon which the whole venture had been based and that the magazine found readers around the world, including significant numbers of modellers who didn't model British outline or to any specific sets of finescale standards - quite an achievement. From issue number 65 in 1993 MRJ changed its cover design for a second time to the style illustrated by issue number 97 on the right. The number and range of contributors was growing, although there had also been some departures. Amongst these was Iain Rice who in 1993 along with Andy Farquarson (who introduced himself very wittily "from the armchair" in MRJ 25) left to set up "Model Railways Illustrated" for Irwell Press. This was a good magazine, but after various machinations it eventually expired towards the end of 1997. Iain Rice had shortly before left to try his own hand at publishing with his ill fated Rail Model Digest and spin offs. If nothing else, this "side story" demonstrates that writing for a magazine is one thing, but editing and more especially managing one is a completely different matter, requiring quite different skills. All of which leaves one even more in awe of the achievement of Paul Karau and his editors with MRJ. Returning to MRJ, John Dornom had found a new way to add real "atmosphere" to his models using a disco fog producing machine and after a brief introduction in MRJ 92 he provided a full article on his extraordinary experiments in issue 97 as illustrated on its cover. In MRJ issue 104 Bob Barlow relinquished the editorial chair after 14 years and 105 editorials and announced that Martyn Welch would be succeeding him. Issue 130 saw Tim Shackleton reviewing and tweaking the then new Heljan Class 47 in some detail, one of the first of the "new generation" of diesel models that have transformed modern image modelling in the last few years. Allan Sibley was the subject of a new feature that Martyn had introduced to the magazine, "The MRJ Interview". In this he expounded on his 20 years experience of the commissioned building of superbly finished locomotives and rolling stock - he reckoned he'd built about 200 locomotives over 20 years. Intelligent questioning and thoughtful responses yielded a very insightful piece on the pitfalls and developments in locomotive kit design in particular . At a more approachable level Stephen Williams was converting the latest generation of Bachmann wagons into P4 models, demonstrating again how much better the then current generation of ready to run models were than anything that had gone before. In issue 144 after 5 years in the editorial chair, Martyn Welch announced that he was stepping down in order to concentrate on his model making business. Looking back, he reflected on his introduction of colour to MRJ and the even more revolutionary introduction of an editorial e-mail address! His successor was to be Tim Shackleton, a modelmaker who had contributed much to MRJ over the preceeding few years. From the following issue and Tim's accession to the editorship, the style of MRJ changed to that shown on the right. The content was as good as MRJ gets, with some breathtaking weathering of LNER panelled stock by none other than Martyn Welch, an introduction to the thinking behind what has become a show stopping exhibition layout "Blea Moor" by Peter Kirkmond and a description of David Lane's visually interesting urban essay "Saffron Street". Bob Barlow returned with a well written and informative obituary to mark the sad passing of Monty Wells, one of the pioneering team that had started MRJ. Issue 163 saw a forthright editorial from Tim Shackleton and the appearance of "Clutton" from Tim Venton, not averse to a little "forthrightery" himself. The fruit of many years labour, Tim's layout is a highly original piece of work and it gave me great pleasure to see it featured in MRJ. Elsewhere in this issue Steve Hall conducted a detailed examination and re-working of the flawed masterpiece that was the Heljan "Dogfish" wagon, demonstrating that not all modern ready to run stock could be converted to P4 without considerable work. And so Model Railway Journal continues, inspiring modellers who seek to improve their art, showcasing the best of British modelling, conducting measured debates about matters of glorious inconsequence and sometimes frustrating us in the pursuit of fidelity to prototype that borders on the insane. Never afraid to say what it thinks, thought provoking and always written in English, it is consistently one of the very the best reads to be found on the newstands. Long may it continue and thank you to Paul Karau, Bob Barlow, Gerry Beale and all those other names who have contributed to its phenomenal and enduring success. A very good searchable index to MRJ is available here, created by Matt Otts it will open in a new window.